After the Confetior and a series of prayers, the priest ascends the altar and begins to read the Introit. During High Mass, this is the set of verses that is chanted as Mass begins. In the Ordinary Form, this is referred to as the “opening verse”, and is actually optional. The priest might say it silently, say it briefly before Mass begins, have it sung and chanted, etc. If we are looking for a way to positively reform the liturgy, the way we handle the Introit should be front and center. 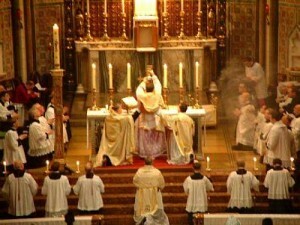 The introit is one of those distinctly Roman traditions. The Introit is simply the singing of certain verses from the Scriptures (or in the case of Feasts surrounding the Blessed Virgin, Christian poets amongst others) that serve as an introduction to the Mass. Predominantly, they are taken from the Psalms. In one form or another, the tradition goes back to at least the early 5th century. It is highly probable that the practice is even more ancient. When the lover of the liturgy Pope St. Pius X proposed reforms, the Introit was one of his central reforms. Like many others, I was quite surprised to learn that for those attending the ordinary form, the Introit is still part of the propers. Yet like many other occurrences, there are allowances for “other suitable” replacements. In practice, whenever this phrase has appeared throughout the missals, traditional customs and piety were abolished within the parish. This is a shame, and something we Catholics should rightly lament. Yet in recent times we are starting to see a change, especially among the “reform of the reform” crowd in both the Extraordinary and Ordinary Form. They realize the importance of the Introit. Why would this matter? First and foremost, it gives the faithful a theme to remember throughout each Mass. The rest of the propers at Mass are intimately connected to the Introit. From the moment that Mass begins when the Introit is used, we are given a key point to remember throughout the Mass. For Trinity Sunday, the Introit talks about the blessed and undivided unity of the Trinity. The propers, including the other Scriptural readings, continue to develop this concept of the Trinity. The Second Vatican Council called for a greater inclusion of Scripture into the liturgy. As a result, an extra reading was added to the Propers. Being faithful to this command, a restoration of the Introit in the parish life would be yet more exposure to the Sacred Scriptures. Most importantly, they allow us Catholics a chance to reconnect with the Psalms. All too often, the Old Testament is treated as something of boredom or pointlessness for the Catholic today. The Psalms are a remedy of this. Throughout all the Psalms, we read and sing a beautiful account of God’s majesty and power. We learn through the Psalms not only that God is to be worshiped, but why He is to be worshiped with concrete examples. We tie ourselves to the great tradition of the people of God, even in the Old Covenant. Even the “Responsorial Psalm” in the modern Rite is all too often abused. Either the same one every week is used, or something new entirely is sang in its place. The Psalms are the true “worship” music of the Christian People. Let us labor to assist in this restoration. Speak to those who are musical directors at your parish. Musical directors, consider going to the books and implementing them into the Mass. Priests, start insist on them being said every Sunday for the congregation’s benefit and your own. If one wishes to truly restore anything, we must start from the beginning. We can find no better start than the Introit.